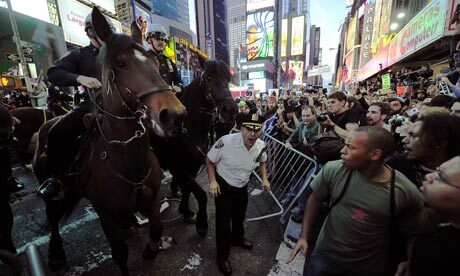 A New York police officer leans forward and yells as if attempting, with the sheer force of his anger, to hold back time. His rage is understandable for, in this photograph, you can actually see the world turn upside down and all that was solid melt into air. This truly is a picture of a turning point in the history of the world. 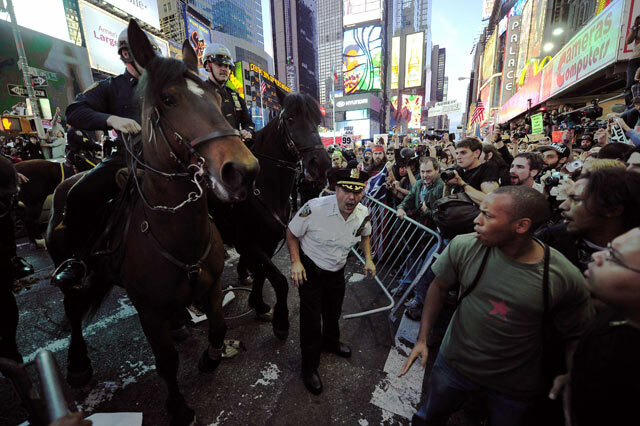 It shows the moment when Occupy Wall Street campaigners reached Times Square, whose giant hoardings glow brightly in broad daylight even as furious protesters confront mounted police. When this photograph was taken, movements were simultaneously starting up around the world in emulation of Occupy Wall Street and its attempt to hold finance capitalists to account. In London and Vancouver, Brussels and – with a violent twist – in Rome, the call went out and the people came. But of all the weekend's photographs of global protest against capitalist excess, this, surely, is the image that will endure. That is because it captures the surrealism of a moment when the stabilities and certainties of an era suddenly became yesterday's distant memory. Times Square makes a powerful setting for this picture. Shiny walls of towing glass, the citadels of corporate entertainment, dazzle among the giant screens – is that Apu from The Simpsons? – in the bright autumn air. But no one is entertained. The faces in the crowd are genuinely angry and determined. A man in the foreground has a red star on his T-shirt. Sixty years ago they hunted reds in Times Square, metaphorically at least, as America fought the cold war. Today that red star says it all. These people have not come to protest just against a bad law or a single issue, but the system itself. They are putting capitalism in the dock. The photograph powerfully captures this moment because it so vividly shows the symbols of the order of things that inhabitants of western economies have up to now accepted. There were "anti-capitalist" protests in the boom years but these were self-evidently marginal to a society lapping up the joys of credit. Today, the world is ready to listen to Occupy Wall Street and its claim to speak for the 99% against the profiteering 1%. Everyone knows what they are talking about and everyone can see some truth in it. This deserves to be the remembered image of a moment when history assumed a new basic structure, but if you wanted to gauge the significance of these events a cartoon in the Times was also telling: a fat cat capitalist looks down on the marchers from a lofty skyscraper office. He comments that the people down there look small enough to crush with one finger. We've already done it, says his cigar-smoking colleague. When such a cartoon appears in the Times, hardly a Marxist publication, the world has changed. This is a photograph of a turning point in history, not because the Occupy movement will necessarily succeed (whatever success might be) but because it has revealed the profoundly new possibilities of debate in a world that so recently seemed to agree about economic fundamentals. Occupy Wall Street and the global movement it is inspiring may yet prove to be an effective call for change, or a flash in the pan. That is not the point. Nor does it even matter if the protest is right or wrong. What matters is that unfettered capitalism, a force for economic dynamism that seemed unassailable, beyond reproach or reform, a monster we learned to be grateful for, suddenly finds its ugliness widely commented on, exposed among the lights of Times Square. The emperor of economics has no clothes. This is an unbelievable moment. Pinch yourself. The global market economy triumphed two decades ago. In the 1980s, it was possible to dispute the Thatcherite cult of "wealth creation", but by the next decade most agreed she seemed to have been right. After the Soviet bloc disintegrated in 1989 the market ruled universally, the communist alternative turned out to have been a grotesque sham, and Bill Clinton and Tony Blair led the left to embrace free finance. This was the way the world worked. The old volumes of Das Kapital might as well go to the secondhand bookshop. In this photograph we see the end of that consensual age, which turns out to have lasted just 20 years, when the free market was essentially beyond criticism. The very use of the word "capitalism" seemed corny a decade ago. What was the point of applying such a term to a way of life that seemed to have no outside to it? Now it is once again a word to hurl as abuse, as it was in the era of RH Tawney, or for that matter Lenin. Capitalism is in trouble because of the very fact that people are once again widely calling it "capitalism" – with the implication that we can dissent from it. Socialist parties first got traction in the 1880s in the economic contraction that Victorians called their "Great Depression". In the capitalist crisis of the 1930s, western intellectuals admired Stalin, Welsh miners fought for the Republican cause in Spain, but many more in western Europe turned to the right. What collapsed was the liberal centre ground. What we see collapse in this photograph is the post-1989 global consensus that unfettered market economies provide the greatest happiness for the greatest number. The slump is making people notice that another way to describe the free market is as Karl Marx's ruthless, tempestuous, darkly creative, but divisive and crisis-creating "capitalism". To say the word is to break a spell. When the system forces ordinary people to become revolutionaries, you know you’re no longer at the End of History. You’re at the very edge of it. Traducción en castellano aquí. Tradução em português aqui. The Tunisian and Egyptian Revolutions. The Arab Spring. The looming Greek default. The increasingly likely breakup of the eurozone. The second coming of the global financial crisis. The return with a vengeance of the systemic critique of capitalism. The resounding worldwide call for real democracy. The dramatic rallies against austerity, inequality and neoliberalism in Spain, Greece, Chile and Israel. The riots in Athens, London and Rome. The occupation of Wall Street and the spreading of the movement throughout the US. The mass protests by millions of people in 1,000 cities and 80 countries on October 15. Even the death of Muammar Gaddafi. All of it points in the direction of a simple but unmistakable truth: 2011 marks the End of the End of History. Beyond the flat horizon of liberal democracy and global capitalism, the events of this year have not only opened up a whole new chapter in the unfolding saga of mankind, but they have laid the very foundation for an endless procession of chapters beyond that. What is being shattered is not so much the democratic capitalist system as such, but rather the Utopian belief that this system is the only way to organize social life in the eternal pursuit of freedom, equality and happiness. Almost twenty years ago, following the total collapse of the Soviet Union and the final discrediting of state communism, the American political scientist Francis Fukuyama conjectured that “we may be witnessing … not just the end of the Cold War, or the passing of a particular period of post-war history, but the end of history as such: that is, the end point of mankind’s ideological evolution and the universalization of Western liberal democracy as the final form of human government.” Two decades after the publication of The End of History and the Last Man, Fukuyama’s thesis seems more shaky than ever before. While 2001 and 2008 marked, respectively, the political and economic deaths of neoliberalism, 2011 marks the End of the End of History. For it is only now becoming clear to the people of the world that, for the past twenty years, we have simply been living a lie. Indeed, the implicit popular consent that once legitimized democratic capitalism now appears to be coming unraveled faster than the financial Ponzi scheme that sustained the illusion of its moral superiority. After twenty years of stagnant wages, rapidly growing inequality, rampant youth unemployment and widespread social alienation, the bursting of the global credit bubble has finally laid bare the naked essence of the system. Democratic free-market capitalism is not what we were told it was: as recent years have amply demonstrated, it is neither free nor democratic. Wars have been waged in the name of Big Oil despite overwhelming popular opposition. Tax cuts have been made in the name of Big Money despite an overwhelming budget deficit. And now, failing banks are being rescued and draconian budget cuts pushed through in the name of Big Finance, despite both overwhelming popular opposition and incontrovertible evidence that it is only making the deficit worse. The system has ceased to make sense. Its internal contradictions are eating it up from within. And humanity is finally waking up to this reality. So today, an entire generation of young people, deprived of hope and opportunity, is rising up to contest the absurd notion that this disastrous state of affairs somehow constitutes the culmination of “mankind’s ideological evolution.” Is this really the best we can do? Is this the Utopian world order that Fukuyama envisioned when he decried the eternal victory of liberal democracy and global capitalism over its invisible enemies? With failing banks, bankrupt states and runaway private debt, Fukuyama’s ideal world has certainly started to look a lot more bland now that the credit-fueled consumption spree that underpinned it has crashed headlong into its own inevitable finality. The magic is gone. The spell is broken. And what the people of the world are trying to make clear to those in power is that we know. We know that the system is rotten at the core. We know that its alleged successes do not hold up to scrutiny. We know that most of its grand achievements — from global capital markets to the European single currency — were built on financial and institutional quicksand. And we know the whole damn thing is about to collapse like a house of cards. From Tahrir to Times Square, from Madrid to Madison, from Santiago to Syntagma, we know that the neoliberal emperor has no clothes. One of the most graphic portrayals of the end of the End of History is the bloody demise of Muammar Gaddafi. While skeptics are entirely right to be disgusted by NATO’s imperial campaign in Libya, many on the Left still fail to see the enormous symbolism behind the fall of the Brother Leader. Gaddafi, in a way, was the ultimate embodiment of the End of History. Having come to power as a pan-Arab socialist revolutionary in the late 1960s, he ended up as one of the world’s most successful capitalists. While he continued to rhetorically lament the evils of Western imperialism, he appeared more than willing to offer his country’s spoils to the same neo-colonial powers he so avidly derided. According to a 2008 report in the Financial Times, Gaddafi “extolled the virtues of capitalist reforms”. Treating Libya like his family business, he cozied up to Big Oil, doling out lucrative contracts to Western corporations like Eni and Shell. He then let the profits accumulate into his privately-owned “sovereign” wealth fund while enlisting Wall Street to recycle this capital surplus for additional profit. In the process, while the Libyan people remained crippled by chronic underdevelopment, Gaddafi siphoned $168 billion of the nation’s riches abroad. No wonder the West was suddenly so happy to be his friend. He delivered a lecture at the Greek Book Centre in Tripoli and taught a class on Libya at Johns Hopkins University. He also offered a lecture, entitled “My Conversations with the Leader”, which marked “the first time that The Green Book has been required reading for students at one of the leading public policy schools in the world.” Apparently, not just us, but Fukuyama himself believed Gaddafi to be the embodiment of the End of History. His overthrow, therefore, even if it would never have succeeded without the military might of the imperial West, completely undermines Fukuyama’s thesis. After all, if we had truly arrived at the End of History, how could the author of this thesis so blatantly end up on the wrong side of History himself? But Gaddafi was not Fukuyama’s only historical “mistake”. In response to allegations that the End of History was a purely Americentric argument, Fukuyama in 2007 wrote an article for the Guardian retroactively claiming that “The End of History was never linked to a specifically American model of social or political organisation … I believe that the European Union more accurately reflects what the world will look like at the end of history than the contemporary United States.” Judging from the fate of the European Union, it turns out that Fukuyama, ironically, ended up being right in the wrong way. As the New York Times wrote the other day, “the euro was a political project meant to unite Europe after the Soviet collapse in a sphere of collective prosperity that would lead to greater federalism. Instead, the euro seems to be pulling Europe apart … [t]here is a tension in the political system and doubt about democratic institutions that we have not experienced since the fall of the Soviet Union.” Europe’s deep economic integration, fully in line with the End of History philosophy, produced a situation so crisis-ridden that the future of the world economy now hinges on the fate of a single EU member state — one that only makes up 2 percent of the Union’s total GDP: Greece. But Greece is only the canary in the coalmine. It is a symptom, not the cause, of Europe’s crisis. When Greece defaults, it will only be a matter of time before investors lose faith in Italy and Spain. Both are considered too big to fail — but also too big to bail. The European rescue fund is not big enough to save them, and Germany and France are stuck in a deadlock over how to enlarge it. At the same time, Europe’s insolvent banking system is on the verge of collapse. A Greek default will tip countless banks into bankruptcy, forcing the governments of the core to dole out massive bailouts once again. This, in turn, will further aggravate their sovereign debt levels and hence their credit ratings, bringing the “Greek” debt crisis right into the very heartland of European capitalism. The bottomline, in other words, is that there is no easy way out of this crisis – not even the oft-lauded eurobonds, as Martin Wolf recently pointed out for theFinancial Times. The euro, that grand elite project that was meant to be the very pinnacle of European integration, is faltering. In the process, the EU’s post-ideological technocratic institutions have lost the last shreds of legitimacy they had left. The edifice is falling apart, and frankly speaking, our leaders do not even have a clue what to do about it. Europe’s crisis, at the end of the day, is the world’s crisis. And it is far from a merely economic one: at rock bottom, we are facing what Joseph Stiglitz has called the ideological crisis of capitalism. This is obviously a far cry from the “end point of mankind’s ideological evolution”. It is no surprise, therefore, that 2011 has seen the comeback — with a vengeance — of the systemic critique of capitalism. In recent weeks, leading free-market publications like the Wall Street Journal, the Financial Times, Business Insiderand Fortune have all admitted that Karl Marx might actually have been right about capitalism’s tendency to self-destruct. The reason for this sudden revival of the Marxian critique of political economy is twofold: first, the dawning realization among elites that we are about to spiral into another Great Depression. And second, the systematic repression of the radical imagination that Fukuyama’s post-ideological world brought about. In this respect, a direct line can be drawn from Margaret Thatcher’s conversation-killing slogan, “there is no alternative“, to the neoliberal policy response to the financial crisis. While the bankers have been doling out record bonuses, the rest of the population is being told that there simply is no alternative to draconian austerity measures. The ideological narrative is the same everywhere: “we’re all in this together; we all need to tighten our belts,” but the implicit message is really: “do not dare to imagine an alternative.” Yet as Matt Taibbi recently pointed out, a tiny 0.1 percent tax on all trades in stocks and bonds and a 0.01 percent tax on all trades of derivatives could pay for the entire US bailouts, rendering much the “necessary” belt-tightening unnecessary. That is a credible alternative right there. Why is it not being discussed? Back in 2009, Fukuyama published an article in Newsweek with the triumphant title “History is still over“, in which he asserted that, despite the fact that “the crisis began on Wall Street – the heart of global capitalism — … the legitimacy of the global system may have been bruised, [but] it did not break.” Fast-forward two years and witness the burning streets of London, Rome and Athens; the peaceful occupation of Wall Street, Puerta del Sol, Syntagma, and hundreds of other squares around the world; the unprecedented global day of action on October 15, with protests in almost 1,000 cities in over 80 countries. Witness the anger. The frustration. The indignation. It is here. The legitimacy is breaking. Fukuyama, it appears, was cheering just a wee bit too soon. In a Freudian sense, we are witnessing the return of the repressed. If you tell people for two decades that there is no alternative to the world in which they live, and if in the meantime you take away their income, their rights, their public services, and their last-remaining shreds of dignity, you can expect that psychological repression of revolutionary potential to come out in some other form sooner or later. If you repress the coherent emancipatory ideology of the masses, as the End of History was meant to do, you literally end up with the incoherent and a-political London riots. In this respect, the most important thing the Tunisian and Egyptian revolutions could have done was to help remind humanity that there actually is an alternative to the status quo — that there does exist some “outside” to unfettered global capitalism. The Arab revolutions emboldened the alienated youth of Europe and America to start dreaming again, to reclaim their radical imagination in the face of one of the greatest legitimation crises in the history of liberal democracy. As a critical consciousness makes its way back into the mainstream discourse, the cultural hegemony of neoliberalism finds itself under threat anew. The first signs of this emergent critical consciousness began to appear in Madrid on May 15. A few days later, the BBC reported that an Egypt-style rally was growing in Spain. Over the next couple of weeks, hundreds of thousands of people from all walks of life rallied on a nightly basis around the country as the indignados movementspread throughout Europe. On September 17, the Spanish 15-M movement culminated into a global day of action against the banks and the occupation of Wall Street, called for by the Canadian anti-consumerist magazine Adbusters. The Wall Street protest subsequently helped catalyze the next global day of action, called for by the Spanish protesters on October 15. Under the common banner “united for global change”, the worldwide resistance grew to truly unprecedented proportions, with simultaneous protests taking place in 1,000 cities in over 80 countries. With his naive declaration that “the legitimacy of the global system did not break,” Fukuyama once again finds himself on the wrong side of history. Zygmunt Bauman put his finger on the crux of the problem: while politics has remained national, power has all but evaporated into global flows. Technological change and neoliberal reforms have conspired to create a situation where democratically elected governments no longer have the power to transform their promises into policies. We end up with a situation where voting is no longer about what policies our governments should put into practice, but rather about who should put into practice the policies demanded by the financial sector. To call that democracy seems preposterous. The rise of the indignant is nothing but the collective realization that liberal representative democracy, under the conditions of deep economic integration, is not really liberal or representative at all. The End of History, rather than solidifying democracy as the final form of human government, has completely undermined it. The End of the End of History is not the same as the end of neoliberalism. As we saw before, zombie ideologies have their way of roaming about beyond their expiry date. As long as there are capitalists (or wanna-be capitalists), there will always be one form or another of capitalist philosophy. The End of the End of History is not so much about eradicating capitalism’s individualist worldview, which is impossible without resorting to the type of repressive state tactics we are trying to overcome, as it is about the return of contentious politics as the defining feature of social life. In other words, the End of the End of History is not so much about overcoming political struggle as about the realization that we can, by definition, never overcome political struggle. As long as there is injustice, there will be struggle — and since there will always be injustice, there will always be struggle. “This is an unbelievable moment,” he continues. “Pinch yourself.” For 2011, with all its crises and revolutions, marks what Slavoj Žižek, in his speech in Zuccotti Park, called “the awakening from a dream that is turning into a nightmare.” It marks the return of contentious politics. And, as such, it marks the End of the End of History. Not that History ever stopped — we just got confused for a while by the collapse of capitalism’s arch-nemesis, and thought it did. But the fact that History is still in-the-making is being captured in newspapers headlines, in powerful photographs, and in the words of a simple middle-class lady in Greece during the 48-hour strike of October: “I have never been a leftist,” she said, “but they’ve pushed us to become extremists.” When the system forces ordinary people to become revolutionaries, you know you’re no longer at the End of History. You’re at the very edge of it.